Serving businesses and individuals throughout south-central Michigan, Abbott, Thomson & Beer, PLC, creates innovative solutions for our clients in many areas of law, including business law, labor and employment law, estate planning and probate, real estate law, and school and education law. Our Jackson, Michigan, law firm offers clients superior personal attention from a team of experienced attorneys. We maintain a strict code of ethical conduct and a dedication to the highest professional standards, which allows us to resolve our clients’ legal issues effectively and efficiently. The lawyers at Abbott, Thomson & Beer, PLC are capable of handling even the most complex matters for businesses and corporations in Michigan. Our lawyers also assist individuals facing legal matters that affect them on a personal level. Our diverse client base consists of individuals, manufacturing companies, software development companies, web-development companies, credit unions, collection agencies, commercial and residential contractors and/or developers, non-profit corporations, local governments and municipalities, as well as school districts and colleges. This broad client base has allowed our lawyers to develop experience in a wide range of legal matters. You may contact Abbott, Thomson & Beer, PLC, by calling 517-917-0946 or toll free at 877-893-0898 or contact us online to speak with a Jackson attorney regarding your legal needs. Abbott, Thomson & Beer acts as general counsel to businesses and corporations throughout south-central Michigan. We advise on contract law, real estate law, labor and employment law, taxation, mergers and acquisitions, and general business planning. Our firm represents employer interests in both the private and public sectors. We work with employers to develop employment practices and policies that comply with federal, state and local employment-related statutes. At Abbott, Thomson & Beer we meet the estate planning needs of individuals and families throughout south-central Michigan. Our team of experienced attorneys gives valuable estate planning counsel to clients with personal and business interests. We provide a comprehensive real estate practice and represent residential & commercial real estate developers, residential & commercial landlords and tenants, farmers, real estate brokers and agents, property managers, and various mortgage lenders. 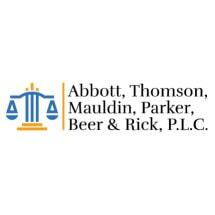 Abbott, Thomson & Beer provides a full range of legal services to schools and educational institutions, representing the majority of school districts in Jackson County.